I have to say that an iris is one of my favorite flowers. They are so gorgeous, such an amazing flower! Have many varieties, and though I love purple, the ones I really love are the big yellow ones! 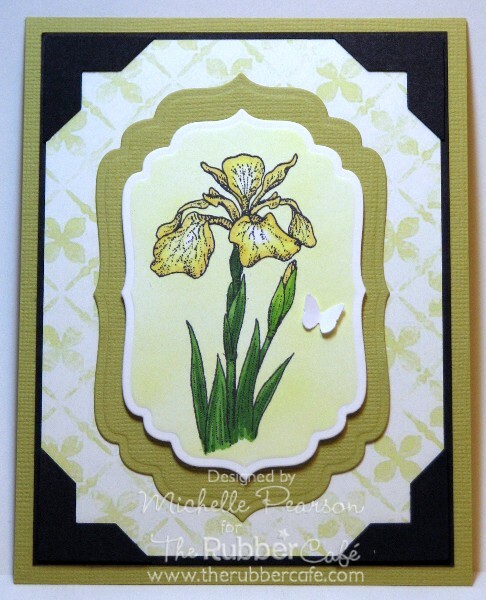 I was happy to see the iris stamp tucked in my design team kit from Melissa...and decided to make my iris yellow! I used Copic Markers (Y21, Y11, YG67, YG17, YG25) and airbrushed my background with YG00. I hope you've enjoyed a peek of spring....I see my iris are popping up and it won't be long until I can enjoy them in nature! Very nice layout...love the little butterfly.